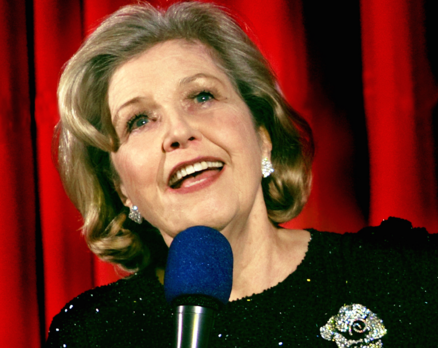 Wrapping up a UK tour, this week sees Anne Reid take up a residency at the Crazy Coqs. Not just as one of the nation’s most beloved actresses, Reid’s cabaret reputation precedes her and her set that lasts the best part of two hours is a delight. Don Black, one of our finest lyricists, loves to see Reid in cabaret for the yarns that she can spin. Much of the evening is spent listening to her anecdotes – and where not so long ago Lorna Luft held audiences rapt with tales of Judy Garland and Hollywood, so too does Reid enthral us, with recollections of a career on England’s stage and screen that stretches back to the 1950s. Her self-deprecating charm takes no prisoners – but it’s impossible not to love a woman who stands on stage wistfully reminiscing about filming a love scene with Daniel Craig in The Mother, before going on to share that Craig is only four years older than her son! Reid defines the concept of bon viveur. Her opening numbers, They Say Its Spring, followed swiftly by I’m Feeling Too Good Today (Reid adding kazoo accompaniment) are an infectious delight. Though it’s far more than just an upbeat view on life that defines this actress as a chanteuse. Alongside her wry take on Makin’ Whoopee Reid offers a gorgeously defined take on Streisand’s 11o’clock classic, The Way We Were. But as Don Black emphasised, it is Anne Reid’s stories that make her cabaret take flight. From Coronation Street to Last Tango In Halifax, her performances are woven into the nation’s DNA - and don’t forget she was the voice of Wendolene in Wallace and Gromit’s A Close Shave some twenty (20!) years ago too. She sagely comments that Shakespeare’s texts are harder to learn than Victoria Wood’s, whilst offering backstage snippets that show her to have been at home in a far-flung provincial theatre as she is in filming a show that is destined to be seen by millions. Reid oozes a rare and humble charm that understates the depth and richness of what has been to date a quite phenomenal career. Her musical director Jason Carr accompanies throughout, occasionally taking to the microphone too. Carr’s keyboard skills are sublime, with an affinity between pianist and diva that is sweet and tangible. It says much for the singer that her encore number was More I Cannot Wish You from Guys and Dolls. The song is finely crafted, soft and enchanting – and not heard often enough. Much like Anne Reid herself.